Streamlined curves maximize comfort - The advanced design of Microsoft L6V-00001 Sculpt Ergonomic Mouse maximizes wrist comfort while making navigation effortless. Shaped to encourage a more natural hand, wrist, and forearm posture, Sculpt Ergonomic Mouse helps prevent the pain of repetitive stress injuries. Advanced Ergonomic Design - Advanced ergonomic design encourages natural hand and wrist postures. 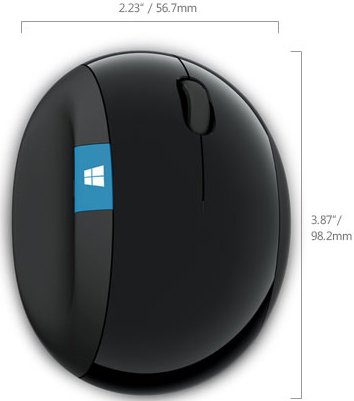 Mouse angle and height - Mouse angle and height are designed to place wrist in a comfortable position and reduce pressure on carpal tunnel area. Thumb scoop - Thumb scoop helps to maintain the correct ergonomic hand and wrist position. Windows button - Windows button for one-touch access of the Start screen. Back button - Back button for faster navigation.